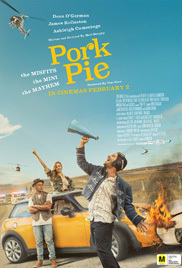 Pork Pie is released in cinemas throughout New Zealand on the 2nd of February, but we’re proud to announce you can see it before it’s official release at the drive-in cinema! We’re touring the drive-in with the cast, crew, and a whole lot of mini’s from Hamilton (Friday 27th Jan) to Wellington (Sunday 29th Jan) and then down to Christchurch (Tuesday 31st Jan). Gates open at 7:30pm with food & drink on offer. Come along early and get a good spot, there will be an introduction from the cast & crew from 8:45pm with the movie starting at 9pm. There are only limited tickets available to this event. Tickets are sold as Large Vehicle or Small Vehicle and is based on height rather than width or length, Small Vehicles will be parked in front of Large Vehicles so everyone has a good view! Large Vehicle Tickets – SUVs, Vans, Minivans, Utes, Reversing Vehicles, Vehicles with high roof racks etc. Small Vehicle Tickets – Sedans, Hatchbacks, Coupes, Station Wagons facing forward etc. M-VLDSR | M Violence,offensive language,drug use and sexual references.